A Boston priest has been arrested and charged with stalking late-night talk king Conan O’Brien. 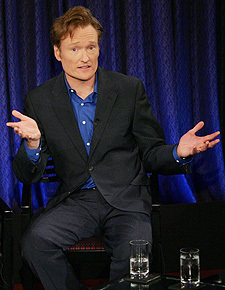 Another threatening note asked Conan, "Is this the way you treat your most dangerous fans?" Ajemian was arrested outside of Rockefeller Plaza while trying to enter a taping of “Late Night with Conan O’Brien.” He could face up to a year in prison if convicted on charges of aggravated harassment and stalking. The Boston Archdiocese said Ajemian, who often signed the notes “Padre,” has been placed on leave.